Explanation: Mars will look good in Earth's skies over the next few days -- but not this good. To get a view this amazing, a spacecraft had to actually visit the red planet. Running across the image centre, though, is one the largest canyons in the Solar System. 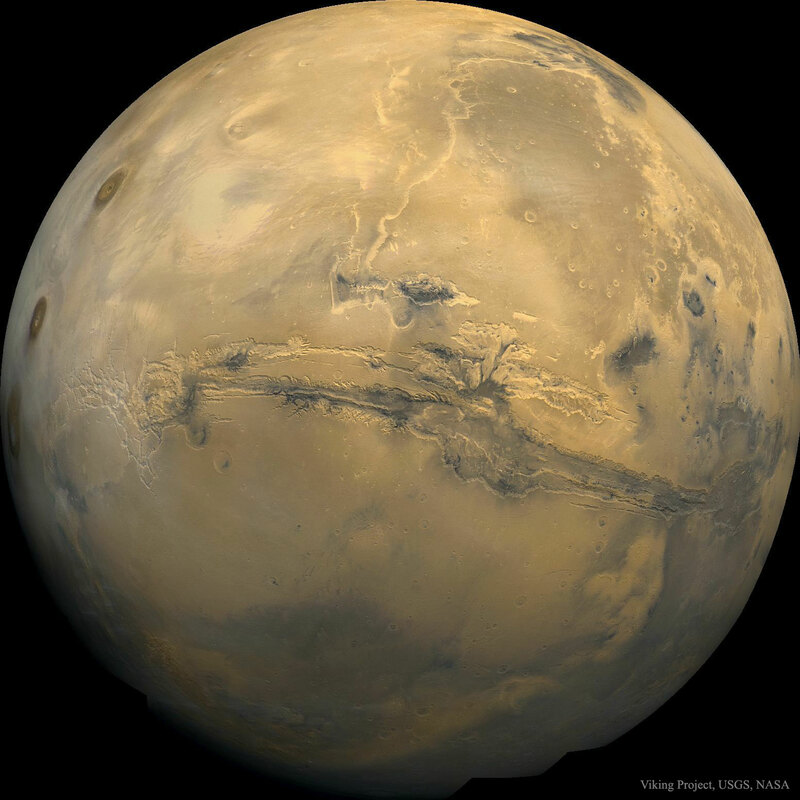 Named Valles Marineris, the grand valley extends over 3,000 kilometres long, spans as much as 600 kilometres across, and delves as much as 8 kilometres deep. By comparison, the Earth's Grand Canyon in Arizona, USA is 800 kilometres long, 30 kilometres across, and 1.8 kilometres deep. The origin of the Valles Marineris remains unknown, although a leading hypothesis holds that it started as a crack billions of years ago as the planet cooled. Several geologic processes have been identified in the canyon. The featured mosaic was created from over 100 images of Mars taken by Viking Orbiters in the 1970s. Tomorrow, Mars and Earth will pass the closest in 11 years, resulting in the red planet being quite noticeable toward the southeast after sunset.